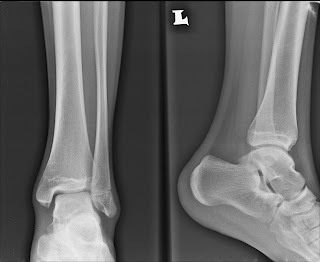 Xray of the ankle from the side. loss of alignment of the ankle joint seen on the xray. Radiographs of an ankle that is affected by Charcot Arthropathy depends on the chronicity of the problem. Deformity and loss of normal alignment is the first this that strikes one's mind. Complete destruction of the ankle joint and the surrounding joints such as the subtalar joint and midtarsal joints maybe evident. We should also look for evidence of osteomyelitis (infection of the bone). This is very important, as this needs to be removed to prevent infection. Charcot arthropathy is very difficult to clinical differentiate from septic arthritis (infection within the joint). Very frequently one can be mistaken for the other. Another investigation to help differential the two is a technitium 99 bone scan. The diagnosis of Charcot arthropathy is made by a combination of clinical impression, radiological investigations (plain xrays and bone scan) and a positive finding of bone shards in the joint synovium (joint lining). Saya penghidap hallux valgus di kaki kanan dan kiri. Tetapi kaki kiri ok sikit, manakala bg kaki kanan ibu jari kaki sering naik atas jari no 2.adakah penghidap hallux valgus sukar berjalan laju dan kaki selalu menggeletar? atau saya ada masalah lain?